Imagine that. I'm here on a Wednesday AND I've got WIPs to post. Shocking, right? Wait, you probably can't see that for the cat, right? An old stack and slash from a class I took years ago. I'm not sure I'm fond of the colours now, but I'll still finish it. 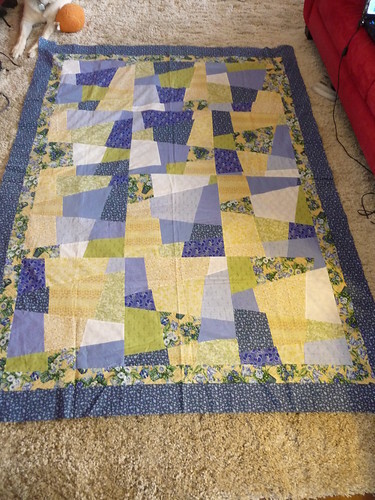 Funny story, I though the quilt top was long lost, so I used the backing I'd bought for it as well as the varigated thread I picked up for the quilting. Oh well, more shopping for me, right? 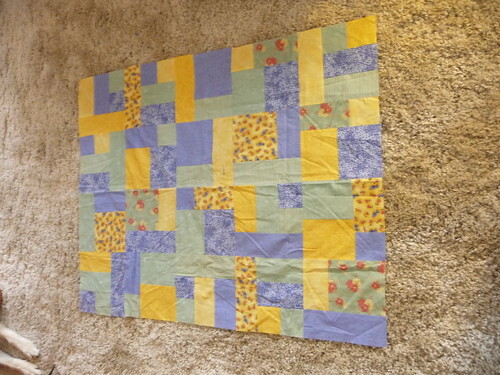 A yellow brick road quilt. I apologize for the quality of this picture. Ideally it would've been taken in much better light and not on my living room carpet. However, we were having ridiculous winds that day (ahhhh Chinooks) and outdoors was not a feasible option. I'll be finishing this up as a baby quilt for a friend. This is a lap quilt I made at the quilt retreat in the spring. It was much quicker than I thought it would be - once I got it laid out. It was random fat quarters from my stash and I bought yardage for the border and the background bits. And finally, some Christmas stars. I also finished this up at the quilt retreat in the spring. So as you can see, I have a lot of quilt sandwiches to make and quilting to complete. Can you tell that's my not favorite part of the process? But at least they're all smaller and therefore easier to work with on my home sewing machine. Ohh, you do have your work cut out for you. I think I enjoy the putting the pieces together aspect more than the actual quilting process. That grey and yellow quilt is wonderful, I hope you finish it soon.